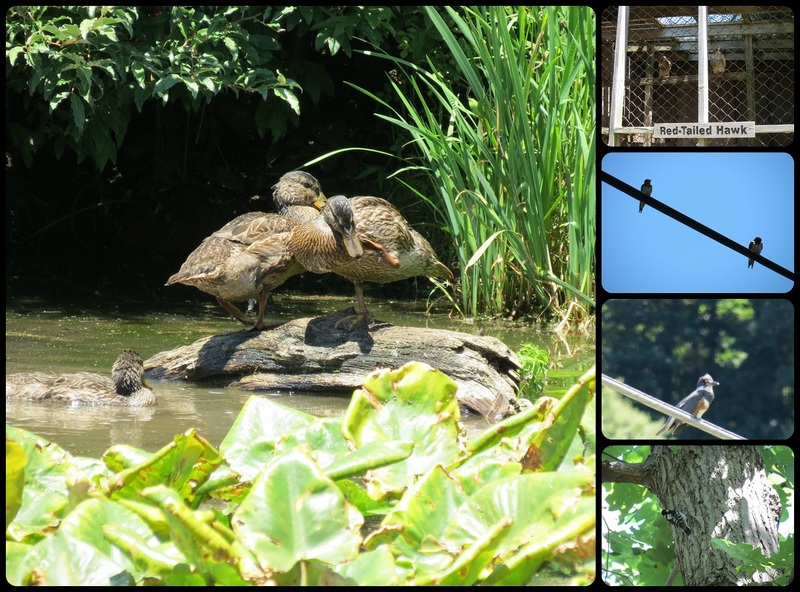 These are some of the scenes we saw during last weekend's walk at the local Hashawha Nature Center. 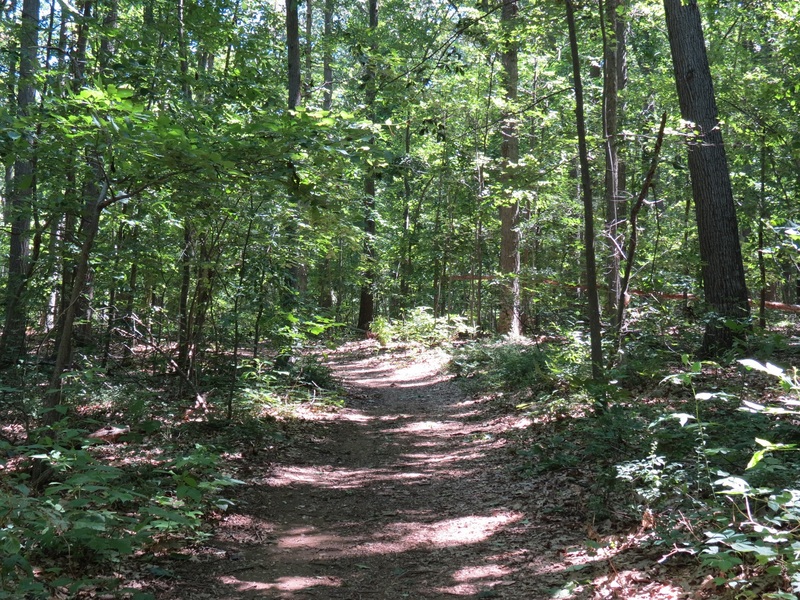 This park is one of our favorites for the birds and wildlife and for the hiking trails..
For my first entry for Blogger's Sunday Walk , I am sharing part of the wooded trail, a scene during our hike at the nature center. July 13 is the first of Blogger's Sunday walk. The next walk will be October 26, 2014. I hope you can join on and walk.. This park is known for seeing the Baltimore Orioles in the summer. 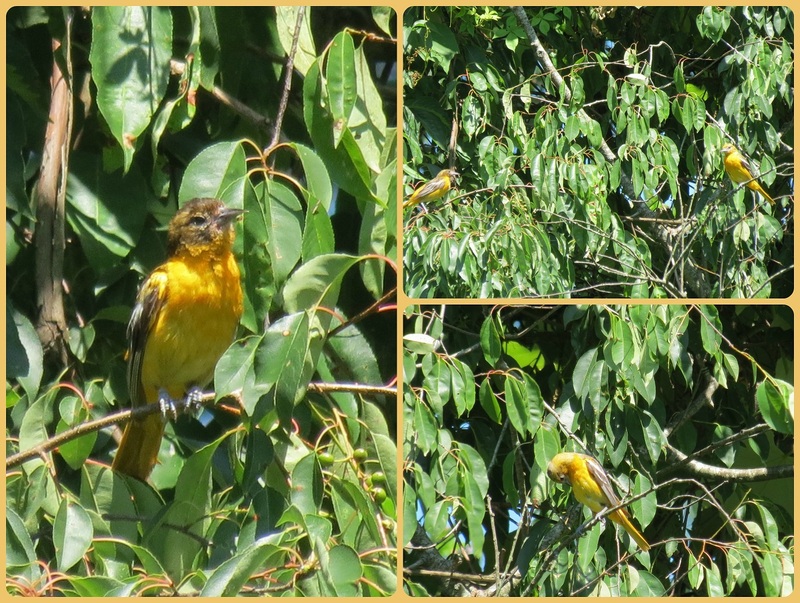 These are some juvenile or possibly the female Baltimore Orioles..
Bee Balm is one of my favorite plants. It is great for attracting the hummingbirds. The butterflies seem to be attracted to all the muddy spots on the trail..
More birds seen at the nature center: Mallards, Red tailed Hawks in the raptor center, Barn Swallows, Kingfisher and Downy woodpecker. 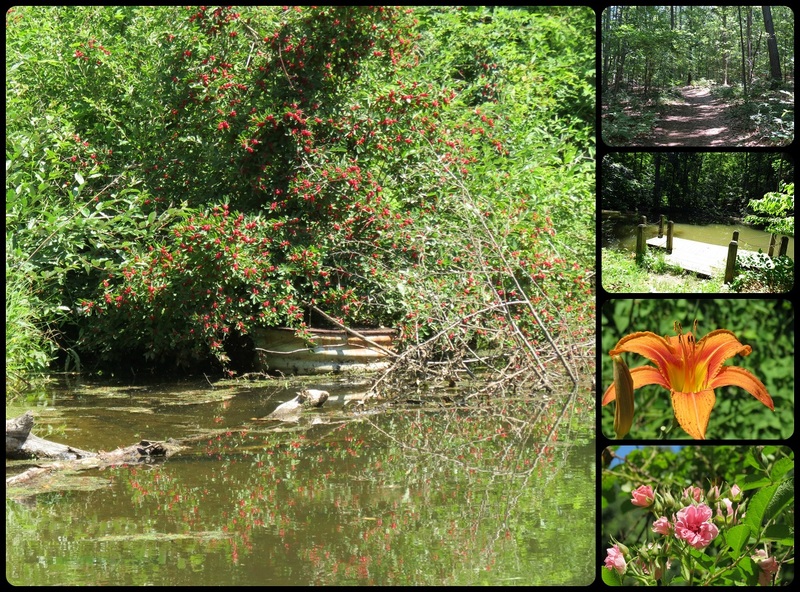 I like the reflection of these berries in the pond, the hiking trail, another pond, tiger daylily, roses. 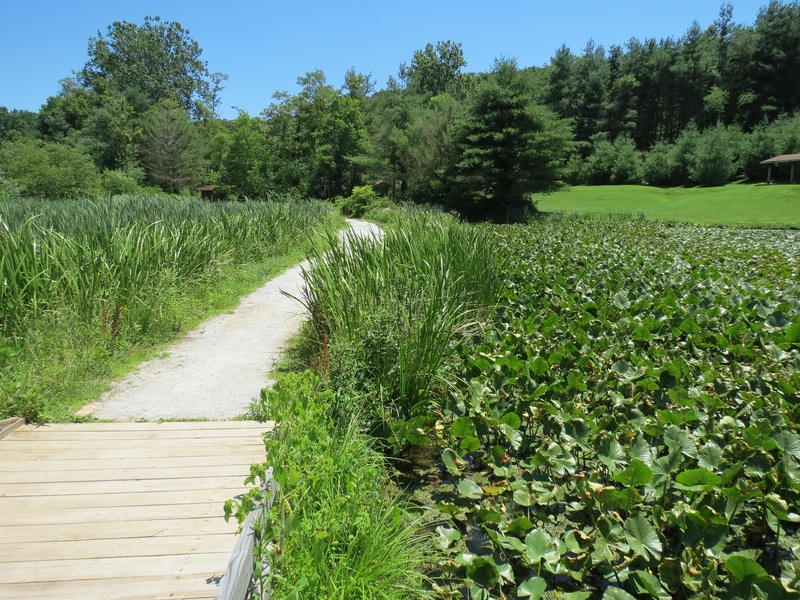 Another scene for my Blogger's Sunday walk post...the lily pads are thick on this section of the lake.. The larger lake is filled with lily pads and dragonflies.. It was a pretty day for a hike, cool temps and beautiful sunny skies. I am always happy to see you visit my post and photos. Thanks for stopping by and for the comments. Thanks to all the host @ Wild & Wonderful and Mary our host of Mosaic Monday and to the hosting group of Our World Tuesday: Arija, Gattina, Lady Fi, Sylvia, Sandy and Jennifer. I wish everyone a happy week ahead! Fotos lindas que realçam a harmonia existente na natureza. I have no links for BSW, but paste your URL in the comment window, and I make a selected post when I come home from holiday next week. The name of this place reminds me of the Indian names used so much here in Florida. LOVE your banner at the top of your blog! It's so bright and beautiful! Enjoy your afternoon my friend! Hugs! You too visit beautiful spots and have such a good eye with your camera. It looks like a wonderful place to walk. That's a beautiful place! Great for photographs! What a nice place to walk. Love the photos you have shared. Have a nice week. My goodness look at all those beautiful dragonflies. It looks as though you had a lovely walk Eileen. That's a nice place. A lot to see ! Through these roads one never get tired of walking. Lovely photos! I love the flowers and the birds and the dragonflies! Looks like a wonderful place for a hike . 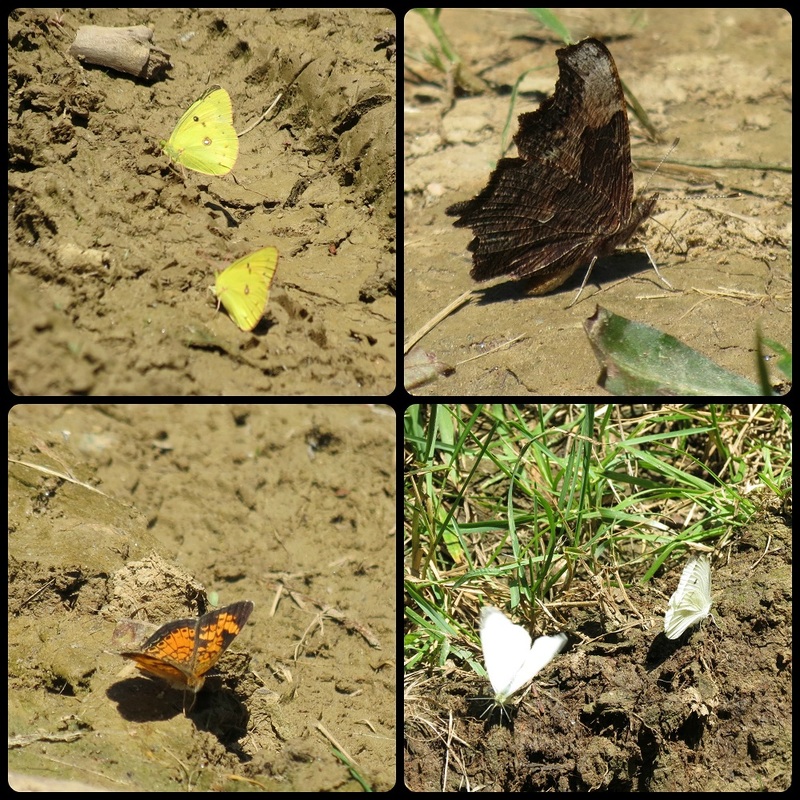 . .
Wonder why the butterflies hover around the mud? Just a beauty, the place that you were in, was an ideal. Thanks Eileen. You always manage to take us on such beautiful walks with you and today is no exception! What a gorgeous landscape this is; love the berries' reflection in the water - pure inspiration for any artist! The birds and butterflies are a bonus! Like others, I enjoy your sharing your walks. Lovely place you visited. Love the Dragon fly and Butterflies! Beautiful scenery. i'm on my way to hike with you. A beautiful place for a walk with lots of critters. I'm always inquisitive about names - was there a sign there saying where the name 'Hashawha' came from? What a lovely walk, Eileen. The one with the section of boardwalk takes me back to Norway where I lived for 18 months when I was much younger - we just don't have that same green lushness here in quite the same way. These are some great shares from your walk. What lovely creatures and scenery! Nice place for a walk. Looks like you saw all kinds of interesting things. I love all the shade you have along your walk and all the wonderful flowers, birds and creatures that you see! What a wonderful place for a walk. There is so much of nature's beauty to take in and enjoy! HI Eileen! I can understand why it would be a favorite place to visit. It's a lovely place in any weather, no doubt! What a beautiful walk Eileen!! I'm with you - love that Bee Balm!! I've never grown it, but wish I could. I know it must have a lot of sun and most of our space is in the shade with lots of trees!! Hi Eileen, Beautiful spot. Lots of birds, too. I sure like the Orioles. Have a fine coming week! Beautiful pictures! What a lovely place! What a lovely park! !Such a beauty! !Beautiful plants and so preety critters to see! !Great shots and wonderful images!Thank you for sharing!!Hugs! 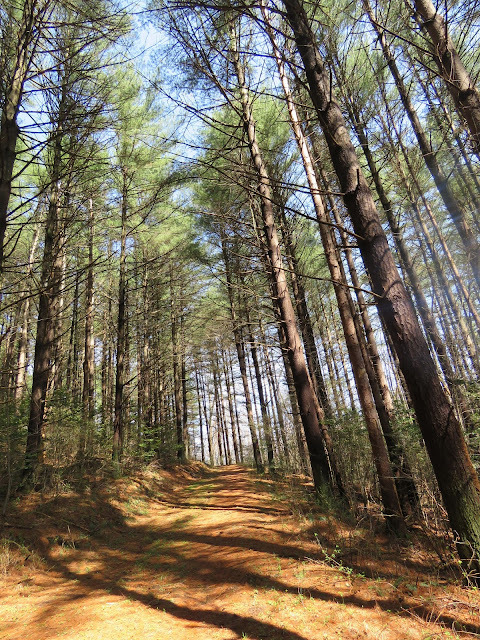 You got some gorgeous pictures of the surroundings Hashawha Nature Center! Baltimore Orioles with tropical bright fiery orange color is so gorgeous! I have made the summary post. Not many walked yesterday. Hope more join us in October! I have made the summary post. Few bloggers walked yesterday. Glad you did! Next BSW will take place October 26 th. Beautiful pictures and collages, Eileen. So much nature! I love seeing all the dragonflies at this time of year. Wonderful place to hike! So much to see and enjoy. I LOVE all the dragonfly photos. Lovely sunny shots Eileen. It looks like a lovely spot for a wildlife walk and I'm mightily impressed with your dragonfly photos and how you made them keep still while clicking away. Have a great week. I think that dragonflies are fairies!! I enjoyed your post and all your photos! What wonderful captures, Eileen!! I love them all and what a great place to spend time!! Thanks so much for sharing the fun and the beauty!! It looks like a very beautiful place for a walk and very well-maintained too. I especially like the Orioles. Lovely images. Especially like the butterflies. Nice photos from an adventurous place! So glad to see your walk turned into such a fruitful one with so many different things to see. Beautiful photos, Eileen! nature's best at this park. i really like the orioles. i didn't realize they are yellow; you know i'm just going by the uni colors of the baseball team so i know orioles are orange, right? A beautiful place, I can see why it's a favorite. Lovely, green photos! Wonderful place to walk and explore. 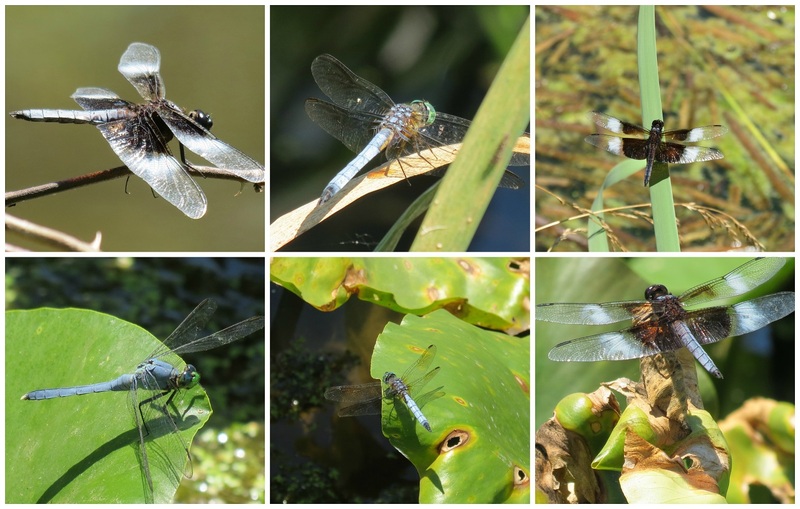 Great shots of the dragonflies and birds. What a nice place to hike. I'm intrigued by the wings of the brownish butterfly in the upper right of the collage. They are an interesting shape. The blooms are so pretty and the butterflies are beautiful!! An awesome collection of images from your walk!! Looks like a great place to enjoy the outdoors and capture images. What a great place for a walk. How very idyllic! Lovely shots. Those orioles are a sight worth seeing. Such colourful birds as well as all the other wonderful sights on your walk. Have a good week. Oh that's bee balm. I see that along the sides of the road here but didn't know what it was. So very pretty. Is it just me or are you more than a bit fortunate with your finds? You have some wonderful shots here of species I would be ecstatic to discover :) That Baltimore Oriole is just gorgeous! thank you for answering my my questions about the red blooms. we were out this weekend in the Smokey Mtns. just got back from them last night. just a 3 day quick trip. & saw folks taking those red blooms every where. & i thought they were gorgeous too. took several shots of them. bee balm. i will have to look that up to see more info. we heard hummingbirds buzzing every where. they are such fast creatures. Marvelous photos of the nature around you. So beautiful is each of them ! Thanks for being our guide:) I know this is a place you go often, but each time you have a different set of photos. I like the idea behind it and it makes sense. Each of us has a spot we regularly visit. Happy birding! Migration is happening already!!! Beautiful place and beautiful photos! Love your collages! Beautiful place! I love the butterflies and the dragonflies. My in-laws lived on Stone Rd, a couple of miles from Hashawha. I went down there often, even before it was fully developed. A lovely place. More people from Carroll Co should visit. What a beautiful place! 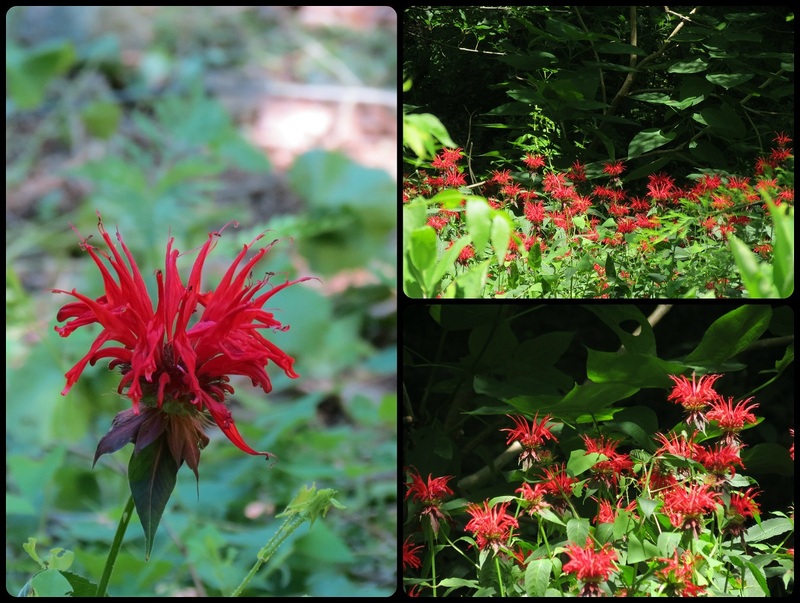 I've seen Bee Balm in Florida too!